Choosing a Miter Saw Blade for your cutting project will greatly depend on whether you are doing rough-cuts on 2x4s, or fine woodworking projects. Believe it or not, the quality of the saw blade will make a greater difference than the quality of the saw. For this reason, it is important to choose the correct saw blade for the job you will be undertaking, as well as considering different saw blades for different applications. It is not unreasonable to own more than one or more saw blades. A high quality, general purpose combination blade, used for most wood cutting applications, is a good saw blade to keep on hand. As its name implies, it can be used for cross-cutting 2x4s in half, or to make finer cuts on various standard wood planks. 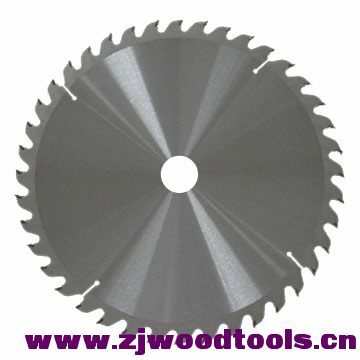 This saw blade will also save time spent in changing different blades to suit different applications. Combination blades are designed with some of the features of the more specialized blades, thus making them extremely versatile. The design of these blades are a combination of gullets, necessary for the removal of wood from the kerfs, and a special arrangement of tips, which helps to produce a smooth cut in almost all woods. The tips are arranged specifically to produce smooth crosscuts at slower speeds and with woods measuring less than 2” thick. Crosscut blades, as the name implies, are designed to make cuts across the grain of the wood. These blades have between 60 and 80 cutting teeth and usually come in a size 10” blade. The blade’s tooth design and configuration are specifically manufactured to cut against the grain of the wood and are configured in an alternating top bevel (ATB). A further improvement of this type of blade is the ATB configuration with a raker feature, commonly referred to as a planer blade. This top raker is designed for clearing out the wood from the cut and works well on plywood, in addition to crosscutting hardwood. It should be noted that in selecting saw blades for miter saws, it is very important to consider blades with a hook angle in the degree range of -10. This will allow for a less aggressive feeding of the wood into the blade, preventing dangerous situations and cuts with jagged ends. A miter saw blade with a high or steep alternating top bevel (HATB) has a special application for cutting melamine or very fine veneers. The tooth shape, in conjunction with a negative hook angle, produces an extremely fine cut because of the blade’s sharpened teeth. A Triple Chip Grind Tooth Shape blade is primarily used to cut hard surfaces like hardwoods, aluminum and laminate flooring. This blade is a great choice for these materials and will last a long time. Additionally, this blade is manufactured with varying hook and rake angles for specialized applications. It should be noted that, although some miter saw blades can be considered general purpose and combination blades, the recommendations of saw blade manufacturers should be adhered to strictly.